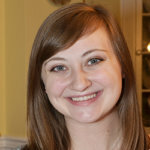 After completing four years as a middle school language arts teacher at Immaculate Conception School in Towson, Nicole Smutny is focusing on her own education as a graduate student at Loyola University Maryland in Baltimore. 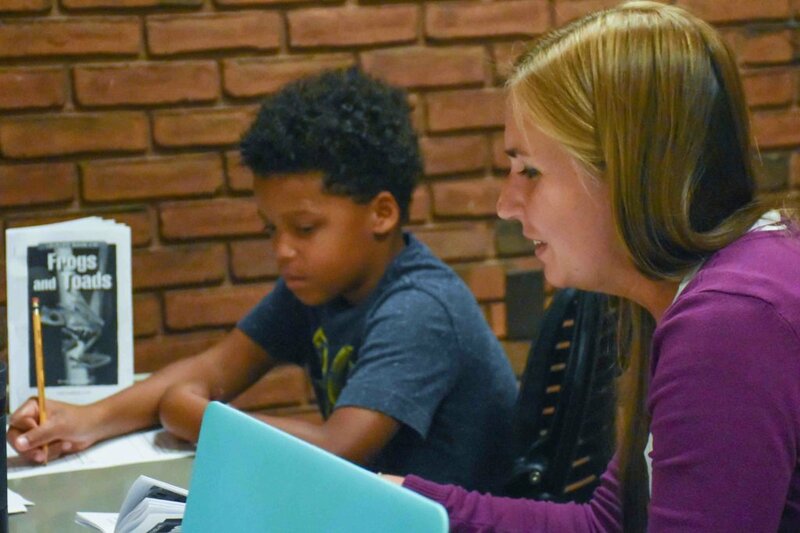 Smutny is one of approximately 15 graduate students working towards master’s degrees in education (with a focus on literacy education) staffing the Literacy Scholars Program, a one-month summer literacy tutoring opportunity for children in grades 3-12. More than 50 children registered – free of charge – for daily one-on-one or small group sessions from June 27 to July 27. The weekday hour-long sessions, under the umbrella of Loyola Clinical Centers, are hosted at the Loyola-Notre Dame Library shared by the two universities in North Baltimore. In individual and small group (3-5 students) sessions, tutoring includes word study, phonics skills, writing and reading comprehension. 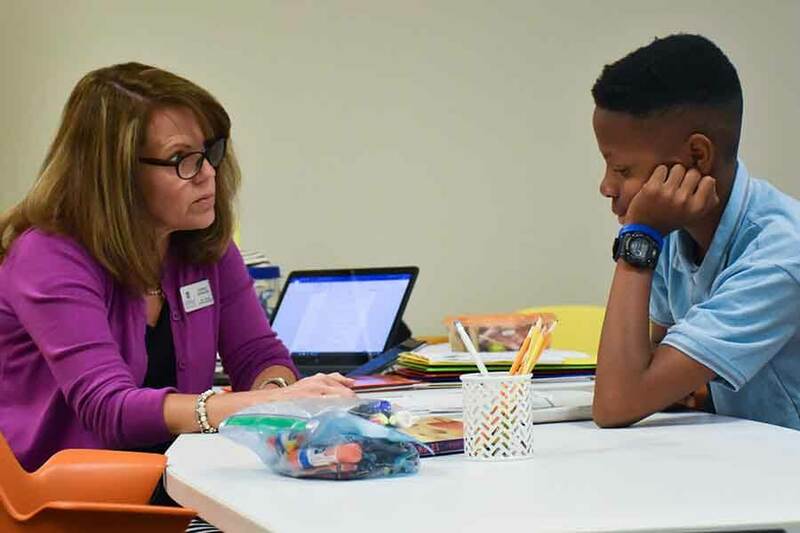 “It’s just for one hour (each day) for four weeks, but it’s definitely impactful because of the quality of the instruction that they’re getting,” Collins said. One of the goals of the seven-year-old program is to use materials that interest the individual child, so that they can have fun while learning. Collins said materials range from nonfiction and fiction books to poetry and song lyrics. “Whatever grabs that child’s attention is what we will use,” she said. When Smutny met the student she would tutor one-on-one, she learned that the rising eighth-grader liked to read about other’s experiences. For nonfiction, Smutny picked out biographies for the girl, but she also knew the perfect fiction book: “The House on Mango Street” by Sandra Cisneros, comprised of vignettes told by the protagonist – a Latina girl in her early teens. Their work did not end with reading the book. By week three, Smutny was helping the student write her own series of vignettes. “Writing is a huge part of literacy, and it is often an overlooked part of literacy,” Smutny said. The majority of graduate students in Loyola’s program are teachers. The Literacy Scholars Program, where graduate students take what they have learned in the classroom and apply it to a real-world situation, is a culmination. The skills and strategies used by the graduate students are based on research and evidence, Collins said, and come from their coursework. The practices, she added, will transfer to their daily work in schools. “They come (to the schools) with not just the book knowledge, but they come with the actual experiential piece that they can apply to future lessons,” Collins said. Smutny mentioned the program’s mentors, who have been instrumental in aiding the graduate students on how to best provide for the children. One such mentor is Sedrick Smith, a 2014 graduate of the master’s program who returned to serve as the morning supervisor of the clinic where he “pays it forward” to current students. Smutny said the skills she is honing will benefit her students and her Immaculate Conception colleagues alike. “It helps me support the other people on my team in the language arts department,” Smutny said. “It’s intense, but it’s totally worth it.